There are 616 articles in this category. In this four-part series, Gary Roberts and Travis Cosentino make their rounds among the elite competitors in the Masters competition at the 2015 Reebok CrossFit Games. Watch highlights from the events, interviews with the athletes, and footage of the trash talk and words of encouragement that motivate some of the Fittest on Earth to push themselves harder than ever. In this four-part series, Gary Roberts and Travis Cosentino make their rounds among the elite athletes of the Masters competition at the 2015 Reebok CrossFit Games. Watch highlights from the events, interviews with the athletes, and footage of the trash talk and words of encouragement that motivate some of the Fittest on Earth to push themselves harder than ever. “If you would’ve told me 10 months ago that I was going to compete in weightlifting in a national championship, I would’ve laughed and called you a liar because I just never thought that I could do something like that,” says Cassidy Duffield of Salt Lake City CrossFit. Steve Cook is a professional physique competitor. Brooke Ence is a CrossFit Games athlete. Watch as two worlds collide when physique meets fitness in a 7-minute AMRAP of front squats and burpees after some heavy power cleans and back squats. Ence introduced Cook to Mike Cazayoux of Brute Strength when Cook expressed interest in CrossFit. “I wasn’t enjoying my training as much because it was all about looks,” Cook says. Meet Ivan Garcia. The 26-year-old waiter and bouncer aspires to be a police officer, but one thing stands in his way: his weight. The restaurant where Garcia works is located in Scotts Valley, California, near CrossFit Headquarters. When Garcia’s mother approached CrossFit HQ trainer Jenny Lau about training her son, Lau was ready to help Ivan reclaim his body. 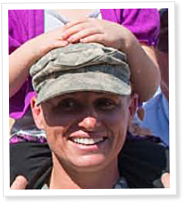 In an exclusive interview, Maj. Lisa Jaster talks about her fight to become the third woman to graduate from U.S. Army Ranger School. In April, 381 men and 19 women entered Army Ranger School, “the most physically and mentally demanding leadership school the Army has to offer,” according to Goarmy.com. It was the first time women were allowed to attend the school. After focusing on competition in 2008, Ben Smith wins the CrossFit Games in 2015. July 26, Ben Smith was crowned the Fittest Man on Earth. And you might have seen it coming.